Ricoh Accelerates Business Shift with Global Managed Document Services Expansion. Focus is squarely on improving customers’ bottom line. 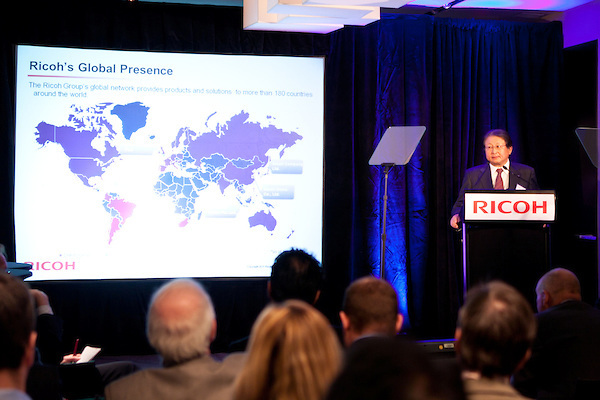 (Click on Image to view Photographer Gallery) Shiro Kondo, President and CEO, Ricoh Company LTD speaking at Ricoh Managed Document Services New York Press Conference on January 20, 2011. Photographer Jeffrey Holmes is a professional photographer in New York, corporate portrait photography, portrait photographers, New York event photographer, photographer for events, event photography New York. 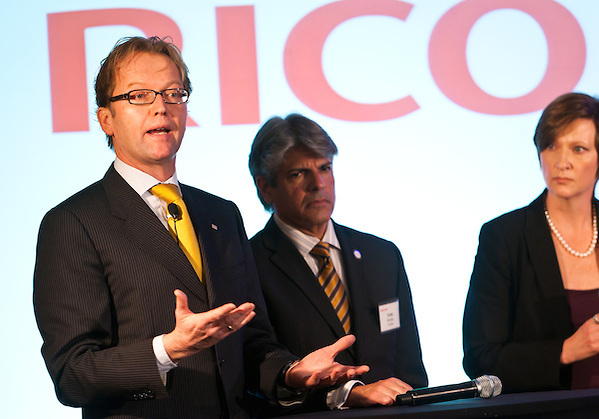 In a global event, held in Tokyo, London & New York, Ricoh Company, Ltd., a worldwide leader in digital office equipment and advanced document management solutions and services, today announced an investment designed to aggressively accelerate its shift to a services business model as a key growth strategy, building upon its core foundation of industry-leading hardware and software technologies and document and IT-related services. To advance this shift, Ricoh plans to invest $300 million USD over three years in its global Managed Document Services (MDS) infrastructure, underscoring the company’s commitment to its continued partnership with its customers, helping them to grow their bottom line through effective document management, improved workflow and increased productivity. New Research Reveals C-Suite Mistakenly Believes Document-Related Costs are Insignificant. Based on research from industry analyst firm IDC and Ricoh MDS engagements, a company with annual revenue of $250 million USD can save more than $6 million USD annually* through effective document management, according to Angele Boyd, IDC Group VP, General Manager, Imaging/Output Document Solutions & SMB. This includes savings of observed costs, such as printing, as well as unobserved costs connected to IT support, documents and records management, environmental, regulatory compliance and end-user productivity. Ricoh Managed Document Services New York Press Conference. Jeffrey Holmes is a professional photographer in New York, corporate portrait photography, portrait photographers, New York event photographer, photographer for events, event photography New York. Ricoh also unveiled new research from a series of global focus groups and surveys with C-suite executives and senior IT managers. The research, conducted in partnership with IDC, found that while businesses are aware that they need to gain more insight into their information and document workflows, they continue to have little understanding of the specific amount of money spent in this area. This is largely attributed to the lack of consolidation of both observed and unobserved costs and fragmented distribution of these costs across different departments within the organization. In addition, there is low awareness among executives of the positive impact a document management strategy could have on the business, including how much could be saved and the overall impact on the bottom line. Harnessing the power of information contained in documents and processes as a core company asset is critical since the way organizations communicate and conduct business is changing at an unprecedented pace. Ricoh’s accelerated shift to services, with a strong focus on MDS, will help customers to become more responsive to the continual flow of information as they address the changes in their industries. 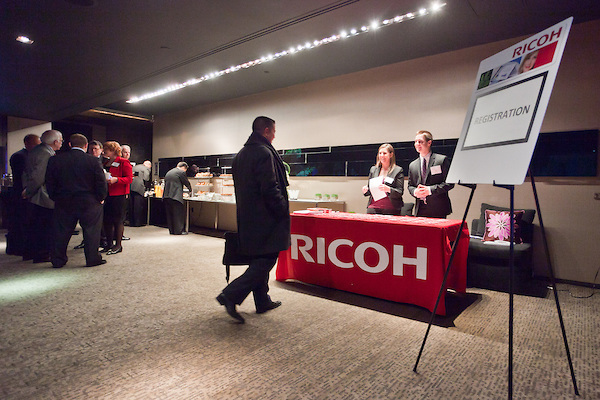 Ricoh Managed Document Services New York Press Conference on January 20, 2011. Ricoh’s investment in its global MDS infrastructure is designed to strengthen its best practices approach and technologies across its global footprint and help the company achieve an annual MDS revenue target of $3.3 billion USD by FY2013. Enhancing Ricoh’s adaptive customer-focused approach, in which Ricoh partners with businesses to help them meet their goals. This approach includes development of Ricoh’s global change management professional services offering, based upon Prosci’s ADKAR® change management methodology, which is designed to help employees permanently change costly document-related behaviors. In addition, Ricoh has globally adopted the ITIL® services delivery framework, which is the most widely used approach to IT services management. Ricoh is also increasing the number of services teams professionally certified in the ITIL® and the ADKAR® methodologies. Improving Ricoh’s holistic, vendor-agnostic approach to information, infrastructure and process management. This approach allows Ricoh to manage a company’s entire fleet, regardless of manufacturer. This holistic approach will be further enhanced as Ricoh accelerates the delivery of a suite of cloud-type tools for device and print management, optimization and decision support. Broadening Ricoh’s global MDS workforce as well as globally standardizing its sales and services training. This is critical to maintaining a globally consistent approach to services delivery, regardless of where the customer’s offices are located. Ricoh has one of the industry’s largest direct sales and services organizations, which currently includes 30,000 services professionals. *Projected annual savings in document management costs for a typical company of this size based upon IDC research and select Ricoh MDS engagements. Individual company results may vary and actual cost savings are not guaranteed. This entry was posted on Tuesday, January 25th, 2011 at 3:03 am. It is filed under Assignments and tagged with business, corporate events photographer New York, corporate photographer, event photography new york, Jeffrey Holmes Photography, new york, new york event photographer, New York freelance photographer, office automation, Peppercom, photographer for events, press conference new york event photographer, professional photographer, Ricoh, W Times Square Hotel. You can follow any responses to this entry through the RSS 2.0 feed. International handbook launch “Constitution-making and Reform” by Jeffrey Holmes, New York event photographer. May 27, 2012 | Comments Off on International handbook launch “Constitution-making and Reform” by Jeffrey Holmes, New York event photographer. Interpeace launched the handbook: ‘Constitution-making and reform: Options for the Process’ a comprehensive resource for national constitution-makers and their advisers… Jeffrey Holmes photographed the launch held at the United Nations. NGLCCNY makes an impact at the 19th Annual GLBT Expo in New York City! Mar 21, 2012 | Comments Off on NGLCCNY makes an impact at the 19th Annual GLBT Expo in New York City! 7th Annual Small Business Summit 2012 intense energy shows in the event photographs. Mar 10, 2012 | Comments Off on 7th Annual Small Business Summit 2012 intense energy shows in the event photographs. Over 500 attendees networked with fellow decision-makers, learned cutting edge ideas during seminars and talked with sponsors offering the newest products & services available to help their small businesses succeed at the Small Business Summit photographed by New York corporate photographer Jeffrey Holmes. Nolcha Fasion Week 2012 New York wows the fashion world. Feb 13, 2012 | Comments Off on Nolcha Fasion Week 2012 New York wows the fashion world. London Fischer selects Corporate Photographer New York, Jeffrey Holmes, for their group photograph. Dec 05, 2011 | Comments Off on London Fischer selects Corporate Photographer New York, Jeffrey Holmes, for their group photograph. London Fischer Law Firm Group portrait by Jeffrey Holmes, Portrait Photographer New York. The Tesla Motors event was photographed by event photographer New York’s Jeffrey Holmes Photography. Jeffrey has served as the MCC photographer for the past 10 years. This event offered a picture perfect show room. Great branding, incredible cars and interesting speakers. Ricoh Press Conference photographed by Jeffrey Holmes, a professional photographer in New York, corporate portrait photography, portrait photographers, New York event photographer, photographer for events, event photography New York.